BOSTON, MA (January 10, 2013)—The Museum of Fine Arts, Boston (MFA), announced today that Amherst artist Sarah Braman is the recipient of the 2013 Maud Morgan Prize. Braman’s art transforms humble artifacts of life in the home and on the road––used furniture, car hoods, even a camper––with rich colors of sprayed paint or planes of cut Plexiglas that abstract the experience of the domestic haven or open road with transcendent, transporting hues. Evocatively titling her works, Braman is passionate that her engaging abstractions are always “about something ... beyond confines of language.” The MFA’s Maud Morgan Prize honors a Massachusetts woman artist who has demonstrated creativity and vision, and who has made significant contributions to the contemporary arts landscape. The Prize was established in 1993 in recognition of the spirit of adventure and independence embodied by noted New England artist Maud Morgan (1903–1999). la Cruz Collection in Miami, and the Zabludowicz Collection Inaugural Installation in Sarvisalo, Finland. 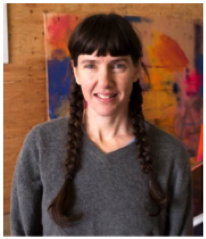 She received a BFA fromMaryland Institute College of Art, Baltimore in 1992 and an MFA from Tyler School of Art, Philadelphia and Rome in 1998. She will be part of the exhibition “Paint Things; Beyond the Stretcher” at the DeCordova Sculpture Park and Museum, opening January 27. Known especially for her sculptures, which combine used items with jewel-toned spray paint or translucent boxes upended at light-catching angles, Braman breathes new life into found materials. She has incorporated objects as diverse as a dirty desk, spray painted foam rubber, the roof of a truck, wooden doors, and a chrome vanity with highly formal, minimal, and clean elements like cast steel and brightly colored Plexiglas. The resulting works are carefully balanced compositions that bring a sense of discovery via disorientation as you move around their complex structures, at once delicate and powerful. 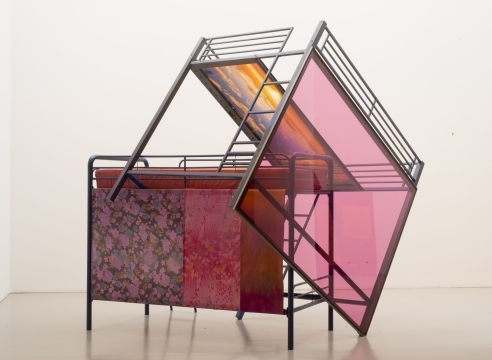 In the 2011 solo exhibition “Yours” at Mitchell-Innes & Nash in New York, Braman introduced a disassembled travel camper into her work. Once an innovative and omnipresent vehicle on American roads, the camper has fallen by the wayside in recent years. Braman fused the camper’s well-worn kitchen and bathroom, among other spaces, with Plexiglas, wood and metal, creating large- scale sculptures that evoke by-gone optimism or innocence in the pursuit of life on the road. The painterly addition of sprayed or brushed color to Braman’s works prompt the viewer to move around the structures in space, following the intuitive trace of the artist’s hand.